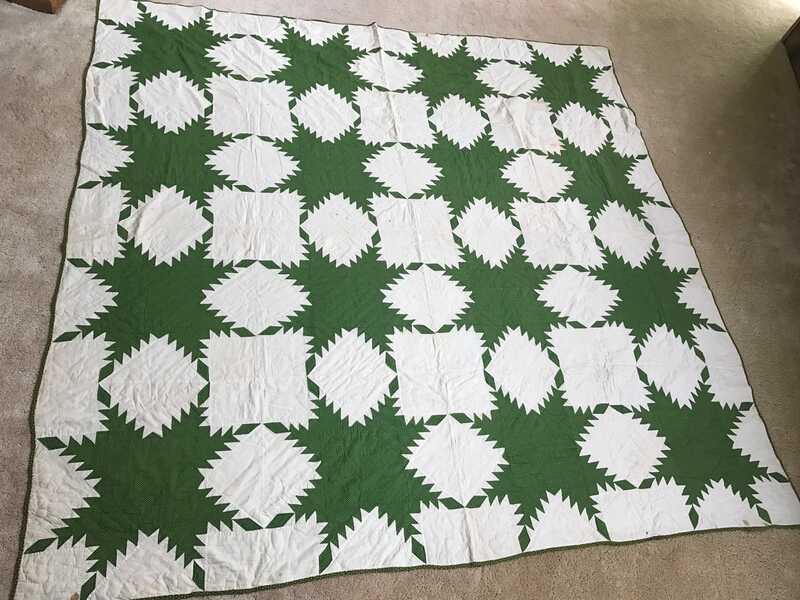 We recently received a beautiful old quilt as a wedding gift from my 92-year old grandmother. Unfortunately, she is in the early stages of dementia and can't remember where it came from. She said it has been in the cedar chest in her house for as long as she can remember. She was an only child from a New York farm family, so we suspect it is quite old,as she doesn't quilt or sew. We would really appreciate any information (age, pattern type, etc.) this community might be able to provide! Thanks in advance for your helpful guidance. Sorry I can't help on age etc, but that is a wonderful old quilt. 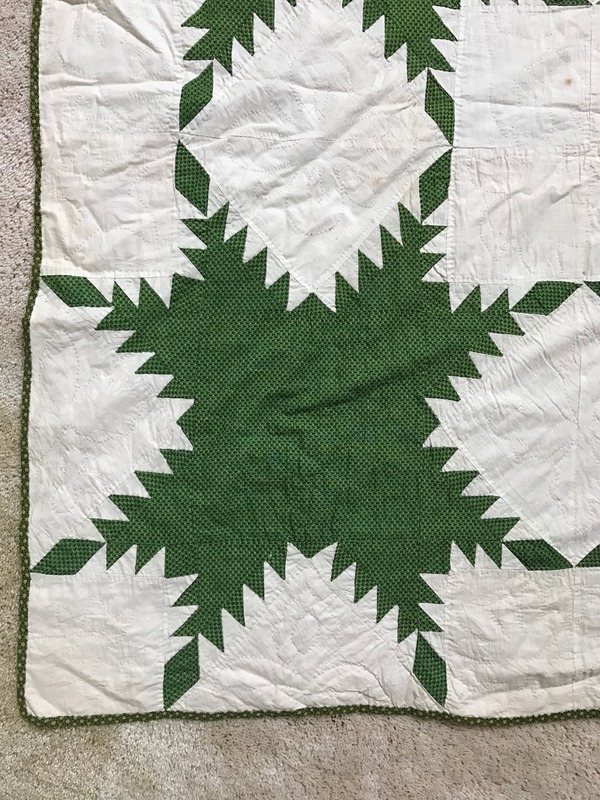 The pattern is called "feathered star" Can't help you with the age but I'm sure someone here can give a guesstimate based on the fabric. It looks to be in great shape. The pattern is Feathered Star but for age , you might need to bring it to a museum to have them date the fabrics used. Here is a link to some information about feathered stars; in particular, read the short "history" section. Fabric looks to be "civil war" era to me, which would fit, but I'm in no way any kind of expert. Just my opinion. She's a beauty, though! Sarge1 you forgot the link. If it were me, I'd have it appraised. That way you will find out info about the possible age of the quilt and fabrics, plus you'll have a valuation you can use for insurance purposes. what a treasure. i agree, feathered star. no age info. 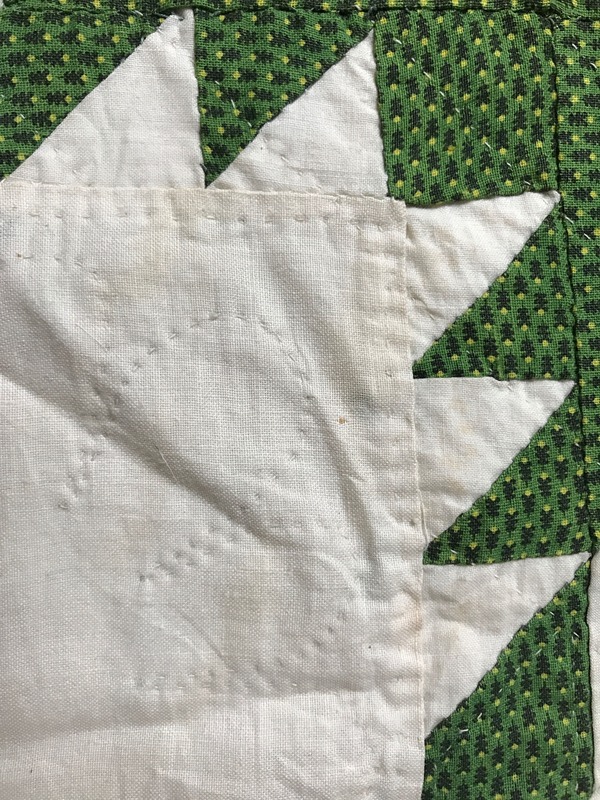 The greens in that quilt are "Poison greens", and date to circa 1870. Beautiful feathered star quilt! Take good care of it. Don't expose it to too much sunlight, extremes of hot or cold (never in an attic! ), and don't let it sit on untreated (uncovered or non-polyurethaned) wood in a drawer, chest, or on a shelf. Never put it in a clothes dryer on hot heat. 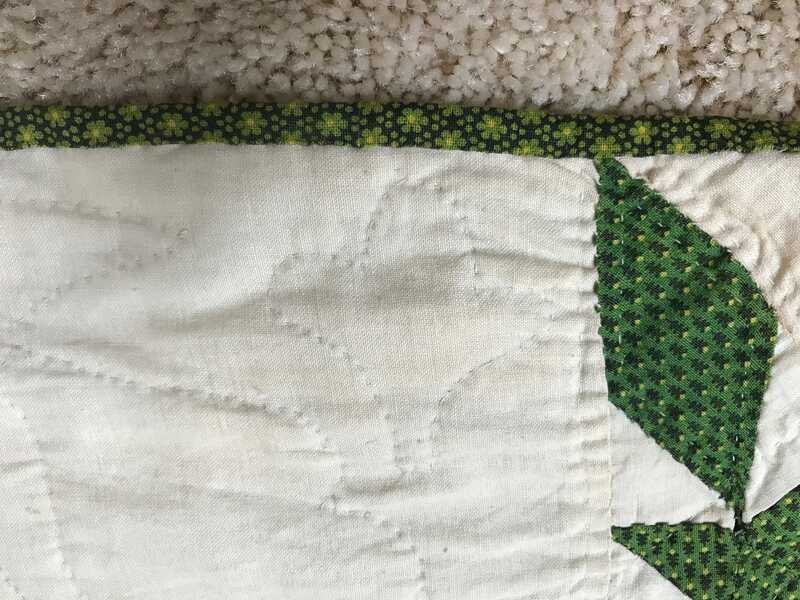 It's cool how some of the binding matches the green in the piecing and some is a different poison green. Last edited by JustAbitCrazy; 09-25-2017 at 12:21 PM. don't know what it really is. I would have it looked at also. Beautiful, you are so lucky to get it. what a wonderful gift! I'd take it to a local museum or work with an appraiser and have them date the fabric and give you tips on how best to preserve it. just beautiful! Thankfully this has been passed to someone who will love and care for it instead of regarding it as "this old thing". When you find out more about it, be sure to put a label with it so the information passes to the next generation. Beautiful quilt--treasure the skill, time and methods of the one who created it. Beautiful. What a treasure your grandma gave you.